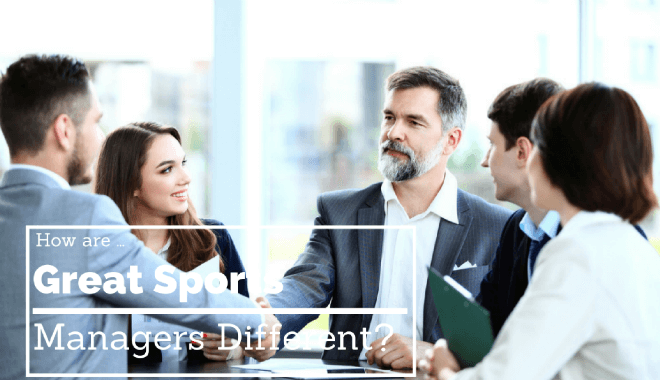 How are Great Sports Managers Different? By the very definition of the position, sports managers are leaders, and in order to effectively do their jobs, leaders must have a specific set of personality traits. There are some traits that can be nurtured and cultivated; however, others are innate. If you are considering entering the sports management profession, take a moment and compare your personal personality traits to those of a successful sports manager to see how they match up. In the sports management profession, having excellent written and verbal communication skills is critical. Both of these are skills that can be improved with hard work; however, being able to effectively communicate your message in a sensitive manner is a trait you are born with. Clients and business associates must be treated fairly. A successful sports manager must make consistent decisions with an unwavering sense of right and wrong. When handling disputes, he or she must devise a resolution that is fair and offers a sense of justice and equal treatment. A sports manager must have the courage of conviction when he or she needs to point out a wrong – whether it be shady business practices or a personal affront. At the same time, they must be willing to acknowledge their own errors. Unfortunately, the sports industry is rife with lack of sound judgement, and sports managers must possess a strong ethical commitment to their field and to avoiding any hint of scandal that could be detrimental to their careers. These two traits go hand and hand with one another. Mastery involves demonstrating a personal commitment to acquisition of knowledge and skills. When he or she is passionate about the job they do, then each new task will be tackled with enthusiasm. Mastery becomes enjoyable, rather than just an obligation. Being a sports manager is a time consuming and demanding job. On occasion, it will require a manager to put their client’s wishes and needs ahead of their own self-interest. When a client or business associate asks the manager to perform a specific task, he or she will know if the request is being made for the greater good or out of selfishness. Sensitivity begets openness. Having empathy for the athletes one works with is absolutely a crucial personality trait to have if you want to be successful as a sports manager. At the very least, one should know when to keep their mouth shut. Things in the sports industry change at a rapid pace, and a successful sports manager must be able to quickly assess emerging trends and determine their viability and applicability to the organization or individual players they work for. At their very core, sports are about teamwork at each level of the game. The primary goal of a sports manager is to assist their individual players in playing as a team. While they must always bear in mind the best interests of their clients, athletes are best served if they are part of a cohesive team. Sports managers themselves are part of a team. They work closely with coaches, sponsors, and trainers to reach a common goal: to get what is best for their clients and to coax out their best performance. Leading often means making decisions. This is applied to all industries, not just sports management. Particularly in high visibility positions, sports managers must be able to make a sound decision and stick to their guns. Each manager must be able to decide how lax or stern they want to be with their players, and this is where the aforementioned sensitivity comes in to play as well. Regardless of how they reached them, a sports manager must also be able to explain their strategies and decisions. A sports manager must build and cultivate a relationship of trust between themselves and their clients, as well as coaches, financial managers, and other individuals with whom they work closely with. They must never reveal confidential information they are privy to, and they must always act in the best interests of their clients. Last, but not least, successful sports managers must be humble. Without humility, you will never get anywhere. Always remember to be respectful of others. Don’t boast about your own abilities. Instead, let your results do the talking for you. If you want to pursue a career in sports management, focus on courses that will allow you to improve your natural talents. This will put you on the path to success.